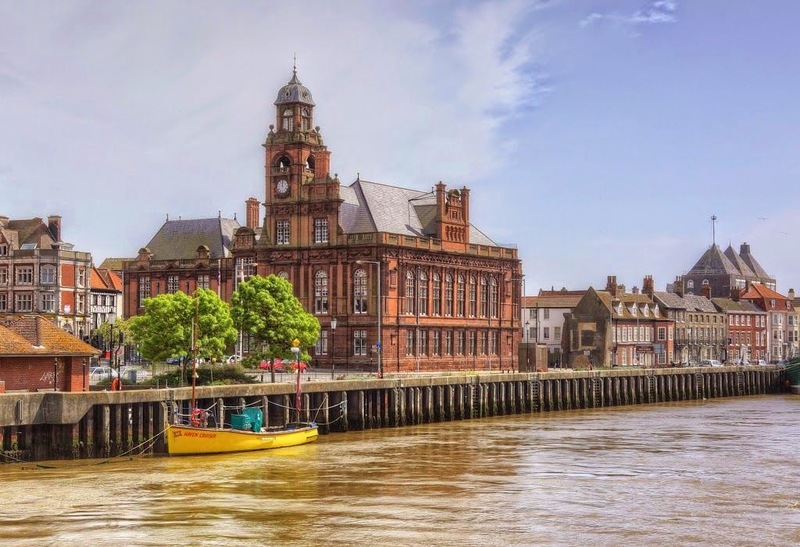 The annual Great Yarmouth Congress took place last weekend at the Town Hall. A total of 85 people entered, across three sections - the Open, Under 165 and Under 130. There were 11 entrants from Suffolk - and some excellent performances! The Open section was won jointly by Suffolk players David Spence (above) and Graham Moore (right), who both scored four points. Both were unbeaten. In the fourth round David beat top seed Terry Chapman, graded 222. Other Suffolk scores were: Steve Gregory 3; Ian Wallis 1½; Silas Peck ½ (all Ipswich). The Under 165 section was won jointly by Suffolk's Richard Lamont (left) and Daniel Frean from the University of East Anglia. The only other Suffolk entrant was Keith Woodcock (Ipswich) on 2½ points. In the 37-player Under 130 section, Mark Pulman (see photo) was the best Suffolk player on 3½ points, with Peter Collicott not far behind on 3. Both players are from the Saxmundham club. Other Suffolk scores in this section were Colin Gardiner (Newmarket) and Roger Smith (Ipswich), both on 2½. All photos courtesy Brendan O'Gorman. 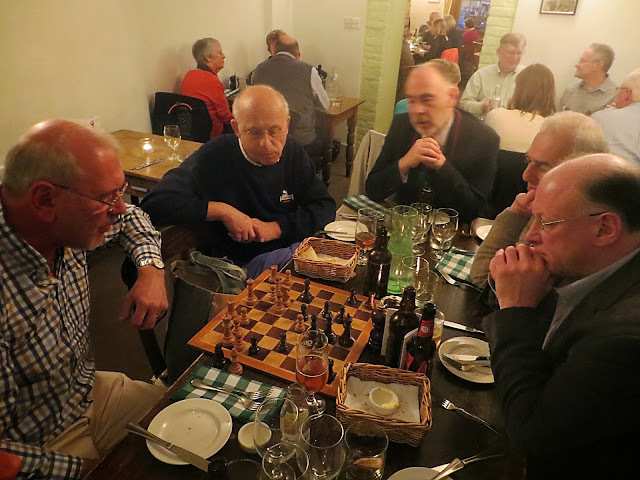 Seven members of the Bury St Edmunds Chess Club - all Division 1 players - enjoyed an excellent congenial meal this evening at 'Pea Porridge' in the town. Of course, the inevitable chessboard was in evidence in between courses and also after the meal was finished. Clockwise in the photo above are Laurie Pott, John Feavyour, Steve Ruthen, Richard Lamont and Colin Roberts. Not in the photo are Ed Player and me (Bob Jones), who was taking the photo. 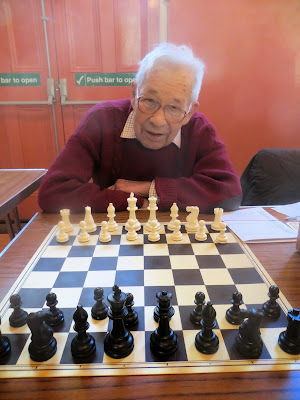 All matches have been completed in the Bury Area Chess League. The Suffolk clubs (Bury St Edmunds, Newmarket and Stowmarket) have experienced mixed fortunes. Division 3 was won by Newmarket Thoroughbreds, with Bury St Edmunds 'E' runners-up. Stowmarket's only team in the BACL finished in mid-table, but the other two Bury St Edmunds teams ('F' and Saffrons)propped up the Division 3 league table. In Division 2, Bury St Edmunds Vipers were runners-up for the second successive year. Newmarket Stallions survived the drop but finished in last-but-one place. Bury St Edmunds have three teams in Division 1. Scorpions and Scarabs finished mid-table, but Cobras, who were promoted last season, came last on tie-break and will drop back to Division 2 next season. The full tables can be viewed here. A 'Last Chance Saloon' tournament took place in Bury St Edmunds yesterday. 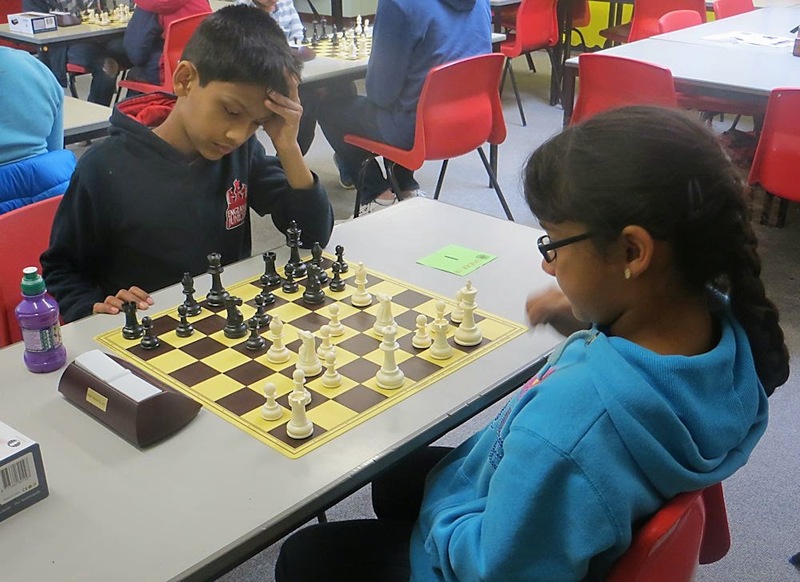 This was an opportunity for children who hadn't yet qualified for the Megafinal stage of the Delancey UK Schools Chess Challenge. 13 children entered, from Suffolk, Essex and Cambridgeshire. Entrants' ages varied from just five years old, to fifteen. Of the 13 entrants, eleven qualified for the Megafinals. Of these, four qualified by achieving the required score, whilst the other seven qualified as highest scorers in their respective age-groups. The photo opposite shows the youngest entrant, Shlok Verma from Ilford, facing the oldest, Anthony Gray from Kimbolton. Qualifiers from Suffolk were Alba Saenz de Villaverde (u15G), Oliver Ransome (u13B), Zac Land (u12B) and Tom Roy (u9B). They will be able to play in the Suffolk Megafinal at Woodbridge School on Sunday 11 May. 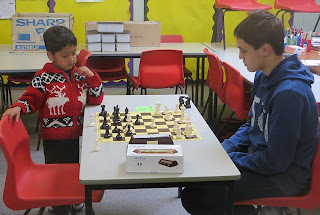 Playing Black in the photo opposite, Aditya Verma, England number four at under 10 (ECF 154), easily won the event, winning all seven games. Following the final result of the fifth round, the Stowmarket Club Championship has been completed. Dave Green and Stephen Lewis finished in a share of first place, with Rob Hayhurst placing third despite unfortunately needing to withdraw during round four. 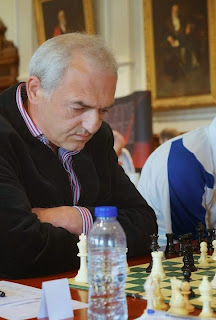 Ray Firman also had an excellent tournament, finishing just half a point behind third place and above four players with a higher grade than him. His grading performance from the tournament was 27 points above his own grade. Although time constraints resulted in the cancellation of a planned sixth round positional playoff, the competition was enjoyed by all and looks likely to become an annual event. Note: In case of confusion - the tournament was started before the season gradings were published, so the grades shown and used were the best to hand at the time and were used for the duration of the competition. 'Official' grading performances for the tournament can be found here. Tomorrow (Saturday) sees the Last Chance Saloon, being held at Horringer Court Middle School in Bury St Edmunds. 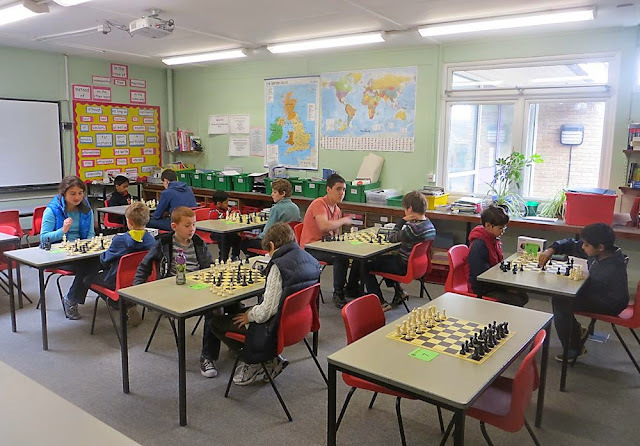 This is the final opportunity for any children who haven't already qualified for the Megafinal stage of the Delancey UK Schools Chess Challenge. The Suffolk Megafinal is being held at Woodbridge School on Sunday 11 May, but other counties are holding their events on different dates. To date 13 children, mainly from Suffolk and Cambridgeshire, have entered tomorrow's tournament. If anyone else wishes to enter, even at this late stage, they should email me straight away. Following Manningtree’s disastrous result against Sudbury last night (they lost 1½ - 6½) the last match of the season now becomes the decider. This match takes place next Tuesday when Ipswich B play Sudbury. With eight points at stake, either Ipswich B or Sudbury must overtake the current leaders. Dave Wild, the Suffolk Grading Officer, has submitted the following statistics from the league season that has just ended. The tables below show the average grade of the player on each board of a team and the final league positions. The grades used are the January 2014 grades or a player's current estimated grade. For each division two extra columns have been added to the final league table. The columns headed BACL and EACU show the points which would have been scored if the leagues had been run using that body's rules. In the Bury Area Chess League an extra point is given to a team which wins a match. 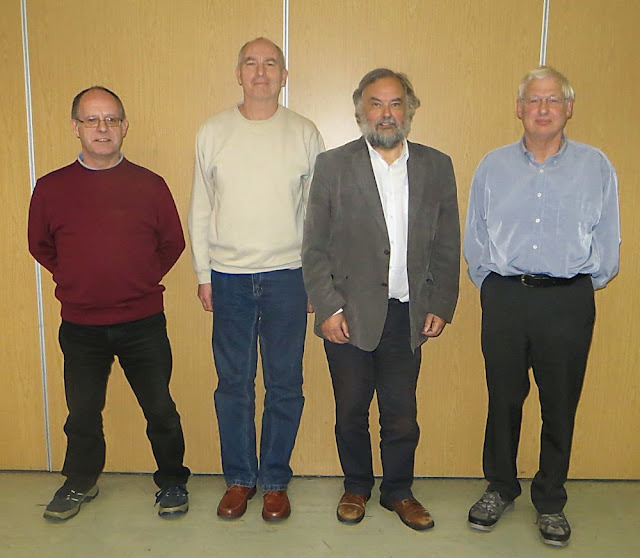 In the East Anglian Chess Union two points are awarded for a won match and one for a drawn match. Division 2 was odd as the two strongest teams were in the last two places. In Divisions 1 and 2 the top and bottom teams remain the same under the SCCA, BACL and EACU rules. In Division 3 under the EACU rules then Clacton would be champions and Felixstowe would be awarded the wooden spoon. Division 1 is shown below. Divisions 2 and 3 will follow in the next couple of days. Not Phil, as you might expect, but Bernard Hopkins, the 49-year old World Light-Heavyweight champion from the USA, who compared boxing to chess in a recent interview. He said, "Chess is a game where you have to use the right pieces and the right moves depending on the set-up, thinking four or five moves ahead. And only certain fighters, who I'm struggling to count on the fingers of one hand, already know what they're going to do four or five punches ahead. The jab is the pawn, but you've also got your bishop, your rook, your knight and, of course, your king and your queen. To survive in the world of boxing, in the world of corporate America or on the streets, it's all about strategy." Suffolk clubs may wish to check to see how much their club is liable to pay in game fees. Last year, when the fees were new, clubs made sure that most of their members had joined the ECF. This year some clubs, in both the Suffolk League and the Bury Area League, have players whose game fees exceed the cost of ECF membership. Here are the current fees payable for events that have taken place this season under the auspices of the Suffolk County Chess Association. The first figure is the number of standard-play games and the second (in brackets) is the number of rapidplay games played. Game fees are £2.00 per standard-play game, and £1.00 per rapidplay game. Payment to the ECF should be made by 30 June. Congratulations to Stowmarket and Sudbury, who have managed to get all their members to join the ECF and so have no payment to make! 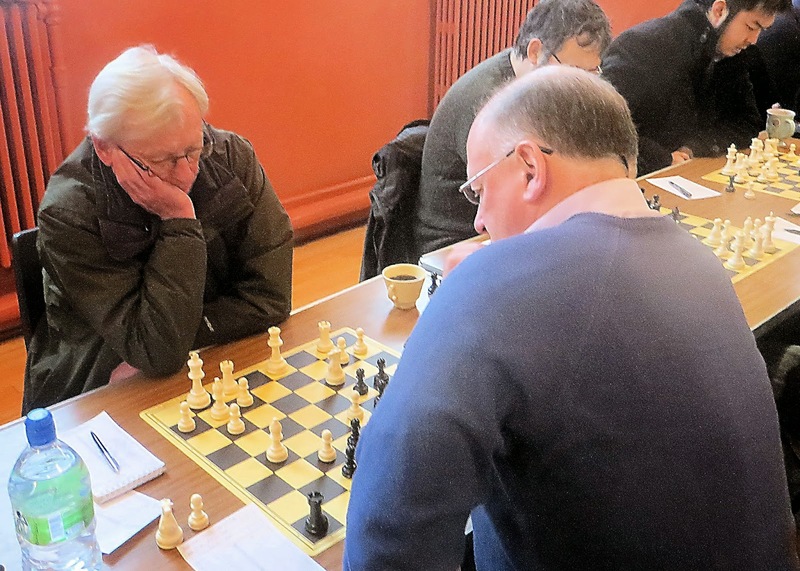 In the Bury Area League, the Roger Goldsmith competition is split into two divisions, with Division 1 having a maximum team grade of 580 and Division 2 a maximum of 450. Games are played at normal time limits. There are five teams in Division 1 and four in Division 2. After the round-robin matches (four rounds in Division 1; three in Division 2), the top two teams in each division play each other again in the Final. The table-topping team has the benefit of a home venue. The final league tables can be seen here (Div 1) and here (Div 2). With the League season now completed, the Players of the Year for the three divisions can now be announced. In Division 3, the winner is Phil Hopkins (Felixstowe), who scored 10 points out of 12. In Division 2, the joint winners are John Peters (Bury St Edmunds) and Ed Kirkham (Adastral Park), who both scored 8 points out of 10. In Division 1, two players scored 7 points - Adam Taylor and Leon Burnett (both Manningtree). However, Adam played 9 games and Leon played 10. There is no tie-break method listed in the rules, so in theory the award is shared. No doubt the SCCA Committee will decide whether the trophy should be shared, or awarded to Adam as his percentage score was better. Engraved trophies will be awarded to the winners at the AGM on 10 June. Next season will see three Bury St Edmunds teams in Division 1, whilst Ipswich will only have two. Saxmundham have not enjoyed much success this season and both their teams will be in Division 3 next season. Whilst all league matches have been completed, there are still matches to play in the Under 125 and Under 145 competitions, as well as the League Cup. The Suffolk Final of the Norfolk & Suffolk Cup, between Bury St Edmunds and Ipswich, will take place on Thursday 8 May. The Delancey UK Schools Chess Challenge, now in its 19th year, continues to attract tremendous support from schools and junior clubs around the UK. These include 12 schools (and one junior club) from Suffolk - see list below. Each of these schools holds an internal tournament during the Spring Term, with qualifiers progressing to the Megafinal, which this year will be held on Sunday 11 May at Woodbridge School. For the past two years, the Bury Knights Junior Chess Club has held an additional event, known as the 'Last Chance Saloon', to give children who either failed to qualify at their own school tournament, or who didn't take part this year for some reason, the opportunity to qualify for the Megafinal. The Last Chance Saloon will be repeated again this year. It will take place on Saturday 26 April, at Horringer Court Middle School in Bury St Edmunds. Entry forms are available from Bob Jones. 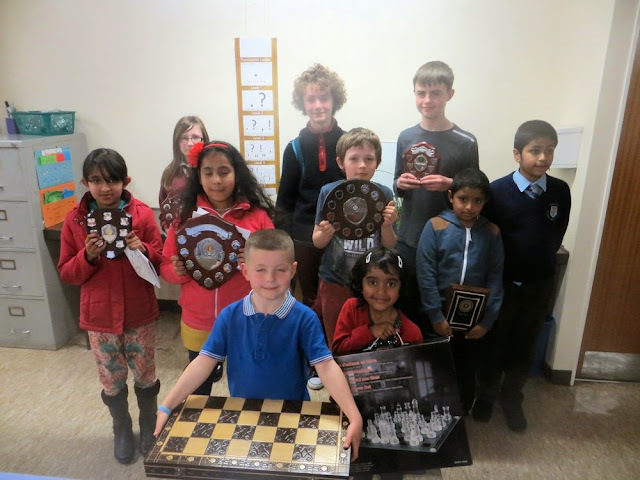 Plus the Bury Knights Junior Chess Club, of course! Back in January, at the Under 160 match between Cambridgeshire and Suffolk, one game featured the Chairman of the Bury Area League, Ole Bay-Petersen and the President of the Suffolk League, Colin Roberts. These two have different job titles, but in effect they both do the same job in the two leagues. Their game was an interesting one, which both players have kindly annotated in some detail. Most of the text is Ole's, but the text in red is Colin's. 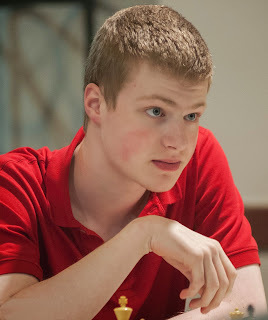 "Since I retired and returned to chess ten years ago, I've probably played fewer than a dozen games against Colin, but I've enjoyed them all - even those I lost - as Colin is a highly enterprising and uncompromising player. If memory serves, we haven't drawn a single game with each other. A few years ago, after a long and exhausting battle, my draw offer was promptly rejected by Colin (who then went on to lose). "I play to win" was the motto of my illustrious compatriot Bent Larsen. It may well be Colin's motto, too! Although our game at Newmarket was flawed, it was very tense and exciting. I know Colin to be a Slavophile, so it was no surprise when the opening turned into the complex and super-sharp Botvinnik variation in the Semi-Slav. This is of course a fashionable and heavily analysed variation, and the first half of the game, as it turned out, consisted of "book" moves. This wasn't actually a result of home preparation (neither of us knew we would be playing one another), and - as far as I can recall - I haven't played the Botvinnik variation with either colour in a serious game since I was young (and that was some time ago). Naturally, I've played over many GM games with that variation, and some of the lines must have lodged themselves somewhere in my memory cells." "I, too, have enjoyed my games against Ole. I think there have been nearer half a dozen than a dozen, but all have been hard-fought. Ole is a tough and very courteous opponent. The Botvinnik Variation of the Semi-Slav was once described by Anatoly Karpov as "one of the sharpest and most fascinating variations in opening theory" and it always provides exciting, unbalanced games. I agree generally with Ole's analysis and I have not duplicated his comments but rather added my thought to his." 1. d4 d5 2. c4 c6 3. Nf3 Nf6 4. Nc3 e6 (introducing Rubinstein's Semi-Slav). 5. Bg5 (the more solid e3 is the Meran system. It shuts in the B on c1, for the time being) 5... dxc4 (Black could also try ... Nbd7 followed by 6... Qa5, transposing to the Cambridge Springs variation. Or 5... h6 [the Moscow variation] 6. Bh4 dxc4 7. e4 g5 8. Bg3 b5 etc). But the Mainline Botvinnik is much more fun! 6. e4 b5 7. e5 h6 (this move transforms the gambit from a White one to a Black one). 8. Bh4 g5 9. Nxg5 (here I also considered playing Bg3 instead, which I dimly remembered a GM playing against Shirov, who continued 9... Nd5 and won a long, tough game). After 9. Bg3, I am a pawn up rather than one down. Also possible is 9. exf6 gxh4 10. Ne5, but I don't think that is particularly good for White. 9... hxg5 (Black can also try the dubious Alatortsev line: ... Nd5 10. Nxf7 Qxh4 11. Nxh8 Bb4 12. Rc1, but this may not be to everyone's taste). I find it hard to believe that the 9... Nd5 line can be at all sound. 10. Bxg5 Nbd7 (Be7 is also possible). 11. g3 (Colin told me afterwards that he was expecting the immediate exf6, but I didn't like the continuation 11... Bb7 12. g3 c5 13. d5 Qc7/Bh6. Later I found out that Shirov has played the interesting 11... Rg8 12. h4 Rxg5 13. hxg5 Nd5 14. g6 with great complications). In his fabulous book on the Semi-Slav, Matthew Sadler gives 11. exf6 Bb7 12. g3 c5 13. d5 as the main line, so I think Ole's fears were unfounded. 11... Bb7 12. Bg2 Qb6 (the most common continuation these days. Botvinnik himself preferred 12... Qa5 here). 13. exf6 O-O-O 14. O-O c5 (here the tempting ... Ne5, which Black in fact played two moves later, allows a thematic and well-known queen sacrifice: 15. dxe5 Rxd1 16. Rxd1 with full compensation for the queen. In his excellent Fire On Board, Shirov mentions that the ageing Botvinnik insisted the sacrifice was unsound, but even as a teenager Shirov knew it was good). 15. d5 (a natural and strong move. White doesn't want to trade bishops, except if he can get his own bishop or knight into the centre). And we have transposed to the mainline. 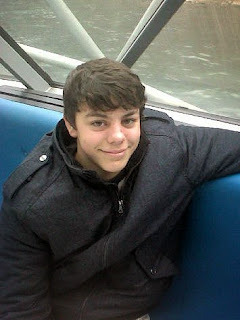 15... b4 (The tension mounts. Black obviously has full compensation for the pawn deficit, and his pawn avalanche on the queenside looks alarming). Again, this move is the mainline according to Sadler. (This was the position in the photo, and the critical moment in the game. Until now Colin had been playing quickly and confidently, but now he sank into thought and caught up with me on the clock. I had played 16. Rb1 fairly quickly, because I vaguely remembered having seen it before when I played my previous move (16. Na4 is the main alternative). Shirov says that the move "somehow doesn't seem so logical to me, but it's terribly dangerous." Colin evidently agreed, and rejected the sacrifice. If 16... bxc3 17. bxc3 Qa6 18. Rxb7 K/Qxb7 19. dxe6(+), followed by e6-e7). 16. Na4 is more usual. 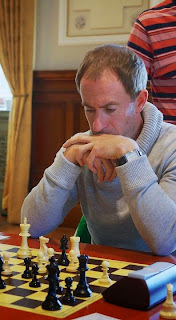 Rb1 was played by Topalov against Kramnik in Dortmund in 1996. I had not played this line for some time and I knew that taking the knight was dangerous, but I wanted to reconvince myself just how dangerous it was! Kramnik rejected the sacrifice, too. I don't know whether Ole is being excessively kind to this move. I had the same thoughts as he when playing it. Ive not seen it written about though, which gives me doubts. 17. Qe2 Nd3 (renewing the threat of capturing on d5/c3, and parking a monstrous knight - or 'octopus', as GM Keene calls it - on an ideal square (Steinitz compared a protected knight on the 6th rank to a rusty nail in the opponent's knee!). Strange analogy. Steinitz was a little unusual but why a rusty nail and why the knee? Taking the knight looks equally dangerous to me. I was happy with the knight on d3 at this stage though. 18. dxe6 Bxg2 (... Qxe6 19. Bxb7+ Kxb7 20. Qxe6 fxe6 21. Ne4 looks more circumspect). I wanted to keep the queens on to maximise attacking chances (I am a pawn down, after all) and, as Ole implied in his introduction, I find it hard to do circumspect! Perhaps this is partly why I have such a low proportion of drawn games. 19. Kxg2 (the tempting 19. e7 Bxf1 20. exd8Q+ Qxd8 21. Kxf1 was equally good) 19... fxe6 (again Black could have played ... Qxe6, but Colin preferred to retain his queen). 20. Ne4 (the knight has done its duty on c3 and now seeks pastures new. It also deters Bd6). 20... Qc6 21. f3 Rd7 (probably aiming for h7). ... Rh7 at some stage was a thought, as was Rhd8 after the bishop moves, but I'm unconvinced about my move now. Perhaps I should not fear ... Bd6, as if Nxd6 and I capture the knight, my own cavalry on d3 is perhaps a little harder to dislodge? I agree that ... Bh6 is poor. ... Bxg5 is not a good idea, whether White takes back with the knight or the pawn. Probably Black should have tried Qd5, despite the baleful glare of Rd1; or maybe Ne5, though here White retains his advantage after 25. Rxd7 Qxd7 [Nxd7? Qxc4] 26. Rd1 etc). I think whereas Ole has continued to play well, my moves 21 to 24 were weak and the game has slipped away. Hence it is hard to find a good move here. 25. Rd2 Bh6 (a surprising, some might say stubborn, return of the hapless bishop. Here I thought Colin was beginning to lose the thread of the game. Afterwards I realised that this was actually part of a cunning plan to awaken his slumbering knight by tactical means). That was the plan, but it is too late, I fear. I think that 'stubborn' is unfair; I am just having difficulty getting my pieces moving now. 26. Rhd1 Bxg5 27. Nxg5 (attacking e6, and better than hxg5, which would allow Black to double rooks on the h-file). 27... Rxh4 (I must admit that this move came as a nasty shock. I'd actually been very conscious of the danger of a fork on f4, and yet I completely overlooked the possibility of the rook sacrifice. When I'd calmed down, I realised that Black's move, though tactically alert, was based on a serious oversight). It was more of a final attempt to bluff! White is unstoppable now, of course. "In the final position White has a plethora of passed pawns, and all his pieces are centralised, whereas the Black king's rook is back where it came from, his queen's rook is pinned, his queen - nestling among the pawns - is out of play, and the Black knight is still looking fine but doing nothing. It's ironic that the White knight, which remained en prise for several moves, ended up - via e4, g5, and f7 - on a square corresponding to that of the Black knight, but whereas the latter could only dream of delivering a family fork, the White knight succeeded in doing exactly that. Despite mutual inaccuracies, I found this a satisfyingly complex and engrossing battle. I think I might try the Botvinnik variation again, as either White or Black, if given the chance. And I'm certainly looking forward to my next battle with Colin!" "I always look forward to games with Ole as they are always fun and played in a totally sportsmanlike fashion. In this game, perhaps I shaould have allowed the queens to come off after all, but then I might have faced a long and losing ending. To the casual observer, this may not look a very good game; there is a lot of theory and then Black plays inaccurately and allows White, who plays far more sensibly, to win, but not before attempting a totally unsound sacrifice! But it felt very different when we were playing and we both enjoyed the game. I congratulate Ole and look forward to our next encounter over the board." With both Division 1 and Division 3 having completed all their matches, the only remaining matches are those in Division 2. All six teams will be playing on either Monday or Tuesday this week. On Monday, Sudbury take on Ipswich D, with both teams in danger of being relegated. This result will be very significant for Saxmundham A, who currenly lie a point adrift of Sudbury in last place. On Tuesday Saxmundham A play leaders Bury St Edmunds C, who need a 3 - 1 win to guarantee promotion to Division 1. Also on Tuesday, Stowmarket A play Adastral Park. Both teams are on 18½ points, 1½ points behind the leaders. Of course, if this result is anything other than 4 - 0, then Bury C will need fewer points to win the division. Four players are still in contention for the Player of the Season award. If John Peters (7½ points) wins his game, he will be Player of the Season. 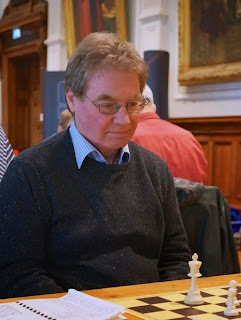 But close behind him are Ed Kirkham (7), Richard Lamont (6½) and John Feavyour (6½). In theory all four could finish on 7½ points, with all having played 10 games. Felixstowe Chess Club started the trend, with Phil Hopkins taking the initiative by setting up a Facebook page for his club. When this was mentioned on this site, Adam Taylor set up a page for League Champions Manningtree. 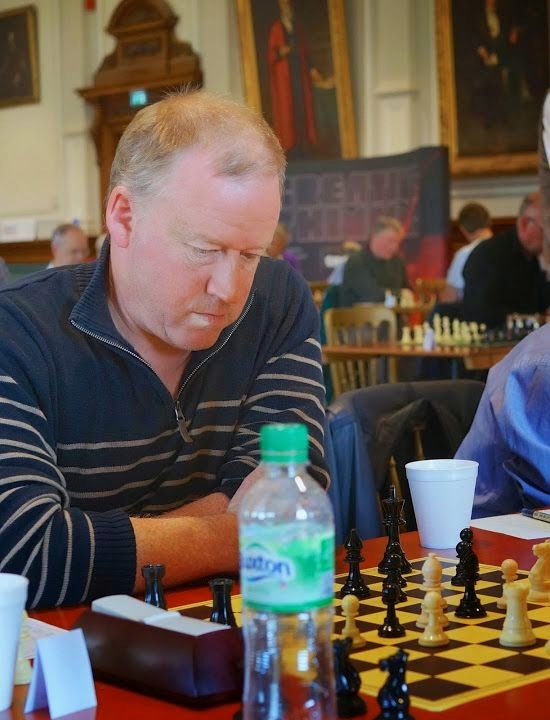 And now Chris Davison has done one for the Bury St Edmunds Chess Club. Please click on these links and 'like' these pages. Felixstowe currently have 20 'likes, Bury 19 and Manningtree 5. It will be interesting to see if these initiatives lead to new members for these clubs. He plays for Linton in the Bury Area League, but many Suffolk players will know and respect John Dawson, who celebrates his 90th birthday today! John not only plays whenever he can (he has already played 36 graded games this season), but he also captains Cambridgeshire's Under 100 team. John is a prime example of how playing chess can keep your brain active and alert. Always ready to give a quick and witty response, I asked him recently when his birthday was; he immediately replied 31st April. He did relent, however, and reluctantly told me it was actually the 11th. We all hope you keep playing and enjoying chess for many more years. The annual ECF Under 18 County Championships will take place on Sunday 29 June, at Wilson's School in Wallington, Surrey. Last year, Suffolk entered a team for the first time in many years. They struggled against tough opposition, finishing 12th of the 13 teams, scoring 5½ points out of a possible 24. Silas Peck's Dad Steve is the Under 18 Team Manager and he will be contacting potential team members over the next week or so. Suffolk won this event in 1997. Martin says, "Had I seen this variation we would have drawn the match 2 - 2 and stood reasonable chances of staying up in Division 1. A very painful loss, and a significant one for the league." Dr John Wharam, Adam Hunt's boss at Woodbridge School, is already an International Master at Correspondence Chess (see the article from this website a year ago). But recently, as reported here, John won a semi-final of the World Correspondence Chess Championship. This qualifies him for the Candidates and means that he has also achieved the Senior International Master title. John's next tournament starts in June when he will play on Board 1 for England in a European Team Championship Semi-Final. John is now targeting the Grandmaster title! This evening saw the last meeting of the term at the Bury Knights Junior Chess Club. As the club doesn't meet over the summer term, this is the occasion when annual awards are presented to deserving members. The winners are pictured above. They are: (Left to right) - Christina James (Attendance award); Bethany Young (Most Promising Girl); Anita Somton (Best rating improvement); Preston Devereux (Most enthusiastic member 1); William Sait (Joint Club Champion); Alex Sheerin (Joint Club Champion); Amy John (Most enthusiastic member 2); Clement Wallace (Player of the Year and Joint Club Champion); Tom Roy (Most promising newcomer); Alan John (Attendance award). The ECF-graded Club Championship was shared between three members, who each scored four points out of five. Following yesterday's article about Felixstowe Chess Club and their presence on Facebook, Manningtree have now followed suit! Inspired perhaps by the article, Adam Taylor has quickly set up their new Facebook page. The destiny of the Division 1 title is still not quite decided (ignore previous assertions on this site; they were wrong). This evening Bury St Edmunds A beat Ipswich B 3 - 1. Manningtree face Bury A next Thursday and any result other than a 4 - 0 loss will see Manningtree as League Champions. The only Suffolk chess club with a Facebook presence is Felixstowe. Click here to see their Facebook page. With social media fast becoming the accepted mode of communication amongst younger people, perhaps it's time that some other clubs copied Felixstowe's initiative. Who will be the second Suffolk chess club to be on Facebook? Phil Hopkins is the man behind their Facebook page; he keeps it regularly updated and is hoping to attract new members as a result. Already, two newcomers have been to the Club and Phil is hoping that more local people will find the site and come along to the British Legion Club on a Tuesday evening.